Ed is a dreamer. He loves his comics and make-believe and isn’t really interested in the grown up world. That is, until a space ship full of intergalactic refugee slaves comes crashing down into his tree house. The three aliens quickly set up shop in an effort to teleport their people to Earth, one by one, to save them from their bonds of slavery at the hands of the intergalactic food court. Others have a different idea. Ed’s bullying rich girl, Natalie, and Maximus Obliterus, the greatest of all the mall security from space are coming in to stop the underground space railroad. Ed is a kid that gets laughed at because he loves to read comics. When his class is discussing what they want to be when they grow up, Ed can’t think of a thing. You cannot make a job out of reading comics, can you? What Ed doesn’t realize is that you can make a life doing the things you enjoy. It just takes some practice and creativity. Even the seemingly silliest things can turn into a successful lifelong ambition. Before Ed can learn all of that, he must help his three friends save themselves and the rest of their planet from slavery. The naughty Natalie, on the other hand, doesn’t learn much. She is interested in pretty, shinny things and acquiring as much as she can. 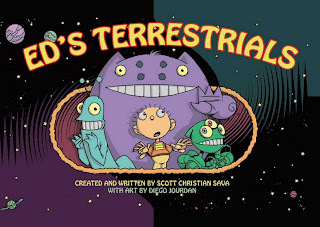 Scott Christian Sava has a winner with ED’s TERRESTRIALS. This is a great book for that day dreamer child – the one who wishes to be more than his or her current life allows. I could write about all the great aspects of the books, but there is a better barometer than my opinion. My daughter and I read this book a few days ago. Ever since, she has asked me to re-read this to her every night, with creative voices to match. She loves the story. A creator can ask for nothing more than to be loved by the children he writes for, and Sava has done just that. UPDATE: When I first posted this, I failed to mention that there was a usage error on page 78. "Your" was used when the word should have been "You're". Diego Jourdan has created a beautiful backdrop to support the writing of this book. His cartoon-style fits the subject perfectly, creating a wonderful product. The characters are alluring and fun to look at. I find that me and my daughter enjoy just looking at the pictures after we have read the text. It is kid friendly and it works. Some younger children, say first grade, will be able to read this by themselves with a little help on some of the words. Others will need it read to them, but it’s time well spent either way you go. This book is perfect for those who enjoy using voices in their reading. This book isn’t limited to young children. Besides being used as a way to encourage and entice students to read, there is also a lesson about careers and finding your own path. The books also touches on slavery that occurs on another planet. A great idea with this book, would be to put up a page on the overhead and ask students to make up their own story. The characters, mostly aliens, would make for good creative development for many students. I would do this before I had them read the book. It would also be a good book for the budding artist. Kids would enjoy reproducing the characters and they would be able to do so without a lot of trouble. That should not be construed as a comment on the quality of the art. The art is great. It is just that the kids would have an easier time reproducing this cartoony style on some level. This is a high quality book that should be in every home, classroom and school library. The story and art function well together to create a beautiful work of children’s literature. 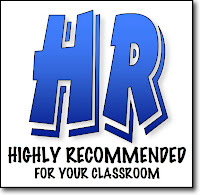 WHAT WOULD YOU LIKE REVIEWED?